A cosmetic company in Gaza has launched M75, a new perfume named after a long-range missile used by Hamas terrorists. “Victory” has never smelled so sweet -- or at least that’s what they would have you believe at the shop selling Gaza’s newest fragrance named M75 after a long-range Hamas rocket. “We came up with the name M75 for a new perfume in the shop as a symbol of the rocket of the resistance, and the victory of Gaza,” Abu Ahmed, owner of the “Stay Stylish” shop in Gaza City’s upscale Rimal neighborhood, told AFP. 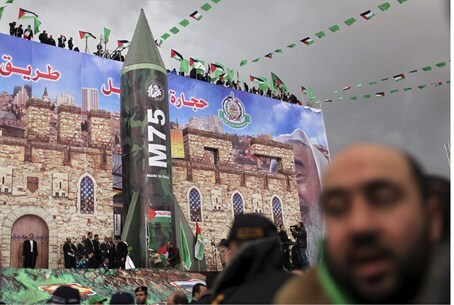 The M75 rocket was among several long-range missiles Gaza terrorist groups fired into Israel during the intensified bout of fighting last month, which ended with a ceasefire between Hamas and the Jewish state. The goal of the perfume is “to promote and market our products, and its only natural to use something like a victory to market our goods,” Abu Ahmed, who declined to give his full name, told AFP. “We want to send a fast message to people about this perfume to market it as quickly and easily as possible,” he said. “People are proud that we were able to hit Tel Aviv and Jerusalem with this M75 rocket and this name is much talked about and liked by people here,” he added, in reference to the cries of celebration that emanated throughout the Arab world as rockets reigned down on Israel. The fragrance, which is available both for men and women, has been successful so far, despite its relatively hefty price, as its “luxurious” components are deemed “worthy” of the terrorists on the battlefield, Ahmed explained, adding that the perfume’s success may result in the M75 label appearing on a whole range of new products.